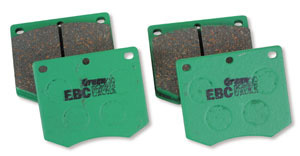 High efficiency EBC Greenstuff brake pads built with aramid fiber, fully shimmed, slotted and chamfered and featuring the EBC patented Brake-in coating for fast pad seating after install. This is a pair of drilled and slotted brake rotors for a Triumph Spitfire. 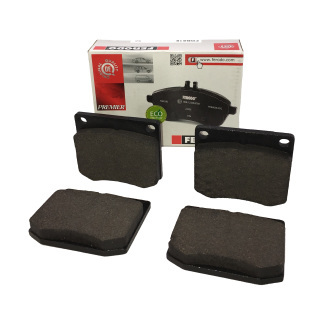 Give your car the best braking possible. Cross Drilling a rotor provides multiple paths to disperse built-up heat and gasses. 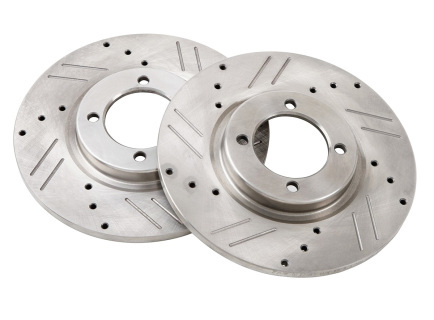 The cross-drilled holes are bi-angle chamfered at the rotor's outer surfaces to help reduce the cracking caused by repeated, high stress, high temperature brake applications. The slots allow the discs to expel built-up brake dust and gases that are generated every time the brakes are applied. The rotors are priced and sold in pairs only.